SoYoung backpack lunch set includes a toddler school backpack with a matching insulated lunch bag to nest inside or clip to the front. Free from BPA, PVC & phthalates. 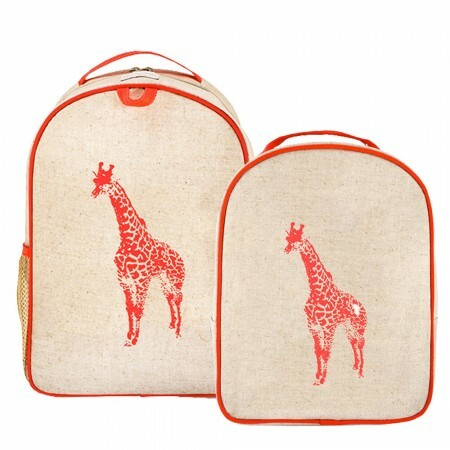 The SoYoung toddler backpack lunch set is designed to accommodate a child's lunch and school supplies in a matching kit. 1 x toddler backpack for school supplies. 1 x insulated lunch backpack, nests inside bigger bag or can be clipped to the front of the toddler backpack for easy carrying. Durable laminated linen exterior coated with EVA. Easy to wipe clean nylon lined interior. 2 mesh side bottle pockets (toddler backpack only) - note: image shows solid pockets, however they are now designed with mesh pockets. Chest strap with clip to keep the bag securely on. Please note: images are a guide only, product is as described.